Claire Laurier Decoteau, Ancestors and Antiretrovirals: The Biopolitics of HIV/AIDS in Post-Apartheid South Africa (Chicago: University of Chicago Press, 2013). Merill Singer, The Anthropology of Infectious Diseases (Walnut Creek: Left Coast Press, 2015). George Lau, Andean Expressions: Art and Archaeology of the Recuay Culture (Iowa City: University of Iowa Press, 2011). Ditchfield K. 2016, An experimental approach to distinguishing different stone artefact transport patterns from debitage assemblages. J Archaeol Sci 65:44-56. Franklin J, Potts AJ, Fisher EC, Cowling RM, and Marean CW, 2015. Paleodistribution modeling in archaeology and paleoanthropology. Quaternary Science Reviews 110:1-14. Pop CM. 2015, Simulating Lithic Raw Material Variability in Archaeological Contexts: “A Re-evaluation and Revision of Brantingham’s Neutral Model. Journal of Archaeological Method and Theory:1-35. Terry Cook, Evidence, memory, identity, and community: four shifting archival paradigm. Archival Science, 13.2-3 (2013). "Archivist Cook advocates for a four-stage co-evolution of the role of the archivist and the archive. He takes a critical look at when and where reflexivity entered archival practice and how this has impacted the production of history from archival materials across time." Liam Buckley, Objects of Love and Decay: Colonial Photographs in a Postcolonial Archive. Wiley, 20.2 (2005). David Foster Wallace, Infinite Jest (New York: Back Bay Books, 2006). Allan Megill, The Prophets of Extremity (Berkley: University of California Press, 1985). Stanley I. Thangaraj, Desi Hoop Dreams: Pickup Basketball and the Making of Asian American Masculinity (New York: New York University Press, 2015). Alisse Waterston, My Father's Wars (New York: Routledge, 2014). Alisse Waterston, Love, Sorrow, Rage: destitute women in a Manhattan residence (Philadelphia: Temple University Press, 1999). Jon Bernard Marcoux, Pox, Empire, Shackles, and Hides: The Townsend Site, 1670-1715 (Tuscaloosa: University of Alabama Press, 2010). It's a narrative fiction about a Sioux girl and her grandmother who are the only ones of their tribe to escape a massacre. They are adopted by the Dakota, and the book describes the various intricacies and difficulties that the two women face in learning the new customs and kinship rules. Deloria is a member of Yankton Dakota, and is a Sioux scholar, anthropologist, and ethnographer. She also worked with Franz Boas. The book is a phenomenal and entertaining read. Rick Bass, The Hermit’s Story (Boston: Houghton Mifflin, 2002). Annie Dillard, “The Wreck of Time”. Harper’s Magazine, (January, 1998). Pat Shipman, The Invaders: How Humans and Their Dogs Drove the Neanderthals to Extinction (Cambridge: Belknap Press, 2015). Ray Atkinson, The Guns at Last Light: The War in Western Europe, 1944-45 (New York: Henry Holt & Company, 2013). Toni Morrison, Song of Solomon (New York: Knopf, 1995). Mike Parker Pearson, Stonehenge: A New Understanding: solving the mysteries of the greatest stone age monument (New York: The Experiment, 2013). Jackie Cahill-Wilson, Late Iron Age and 'Roman' Ireland. Barbara Myerhoff, Peyote Hunt: The Sacred Journey of the Huichol Indians (Ithaca: Cornell University Press, 1974). Benjamin Zeller, Heaven's Gate: America's UFO Religion (New York: New York University Press, 2014). Sheila Jasanoff, The Fifth Branch: Science Advisers as Policymakers (Cambridge, Harvard University Press, 1998). Mutual Chemical of America, Chromium Chemicals: Their Uses and Technical Properties (New York: Mutual Chemical of America, 1941). Lucinda Ramberg, Given to the Goddess (Durham: Duke University Press, 2014). Saba Mahmood, Religious Difference in a Secular Age: A Minority Report (Princeton: Princeton University Press, 1962). Baptist, Edward 2014. The Half Has Never Been Told: Slavery and the Making of American Capitalism. Basic Books. "This should be required reading for every American and if it doesn't win the AHA book award this year it will be a true crime. Who knew that NYC was so implicated in financing King Cotton that it tried to secede with the South? Turns a lot of current historiography on its head--and (consulting my crystal ball) in the next twenty years will be amplified/scaled up from the American case to the global condition in the 19th century. Read with Shama's Rough Crossings, it recasts understandings of US history in the most profound ways." Bloch, Maurice 2012. Anthropology and the Cognitive Challenge. Cambridge University Press. "His most cogent assault on the anthropological tradition that stretches back to Sapir and takes language as the strongest analogue for culture. Wish Geertz was still around to think aloud about this." Kohn, Eduardo. 2013. How Forests Think: Toward an Anthropology Beyond the Human. University of California Press. "Latour's actancy on steroids, still too early to say much...however an aside-archaeologists may also find something here to mull over." Carrier. James and Kalb, Don (Eds.) 2015. Anthropologies of Class: Power, Practice, and Inequality. "Cambridge University Press. Also very early--but Kalb lays out in the intro a sophisticated case for why class matters and what it is that rips into the narrow operationalizations that hold sway and represent a too-often unrecognized departure from Marx and Engels--and finally the consequences of the discipline's reflexive rejection of 'grand narratives'. Like Bloch--whether you agree or not--this is the kind of argument that (in my view) we would benefit from much more of. By the way-also perhaps the best (or most provocative at least) history of post-WWII anthropology I have run across. So far 2 essays in and both reach the threshold of 'this really makes me (re?)think'." S. Lochlann Jain, Malignant (Oakland: University of California Press, 2013). Louisa Lombard, "Threat economies and armed conservation in northeastern Central African Republic," Geoforum (2015). Thomas Pynchon, Gravity's Rainbow (New York: Viking Press: 1973). James Ferguson, Give a Man a Fish (Durham: Duke University Press, 2015). Frederic Gros, A Philosophy of Walking (London: Verso, 2014). 1. Demian: The Story of Emil Sinclair's Youth (London: Peter Owen & Vision Press, 1960). 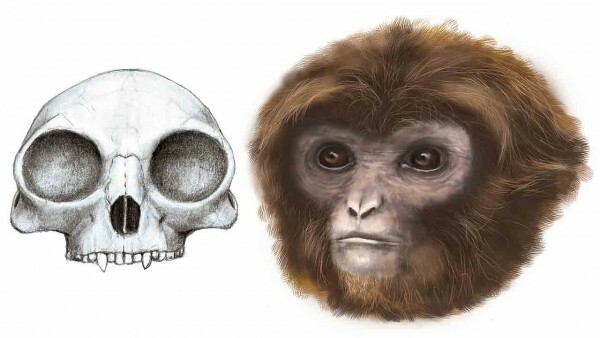 According to Science News, the partial skeleton of an 11.6-million-year-old primitive ape, dubbed Pliobates cataloniae and found near Barcelona, Spain, may force scientists to re-imagine the ancestor of all living apes and humans. With a muzzle like a gibbon but a large brain for its body size, the ancient primate has traits that link it to all apes and humans—yet it weighed only 4 kg to 5 kg. Almécija said he was invited to analyze the fossilized remains by IPC back in 2011, when they were discovered during the construction of a landfill near Barcelona. He said he and his teammates were “stunned” to find a number of similarities between the new species and living apes. The Department of Anthropology's own Dr. Stephen Lubkemann was featured on CBS's 60 Minutes this past Sunday, November 1st. Dr. Lubkemann discussed his involvement with the recovery of the slaving vessel the Sao Jose, which foundered off the coast of Mozambique and South Africa in 1794. The excavation of the ship was a collaborative effort undertaken by members of the international Slave Wrecks Project including Dr. Lubkemann, curator at the Smithsonian’s National Museum of African American History and Culture, Dr. Paul Gardullo, IZIKO (Museums of South Africa), and the U.S. Park Service. In an exciting partnership, the Smithsonian National Museum of African American History and Culture will showcase select artifacts from the site in its inaugural exhibit on the history of the slave trade upon opening in 2016. The Slave Wrecks Project grew out of research initiated here at GW and incorporates a variety of different GW departments and programs including Anthropology, the Capitol Archaeological Institute, Africana Studies, the Diaspora Research Program, and the GW Institute for International Tourism Studies. According to Dr. Lubkemann, the project has in turn been able to offer opportunities for research and various other types of involvement to over twenty undergraduate and graduate GW students since 2010. It has also spearheaded the development of in-depth GW partnerships with the newest of the Smithsonian museums, as well as with other national and international partners—now in at least 9 different countries including Mozambique, South Africa, Senegal, Portugal, Brazil, and Cuba. View the 60 Minutes segment on the Sao Jose project here!